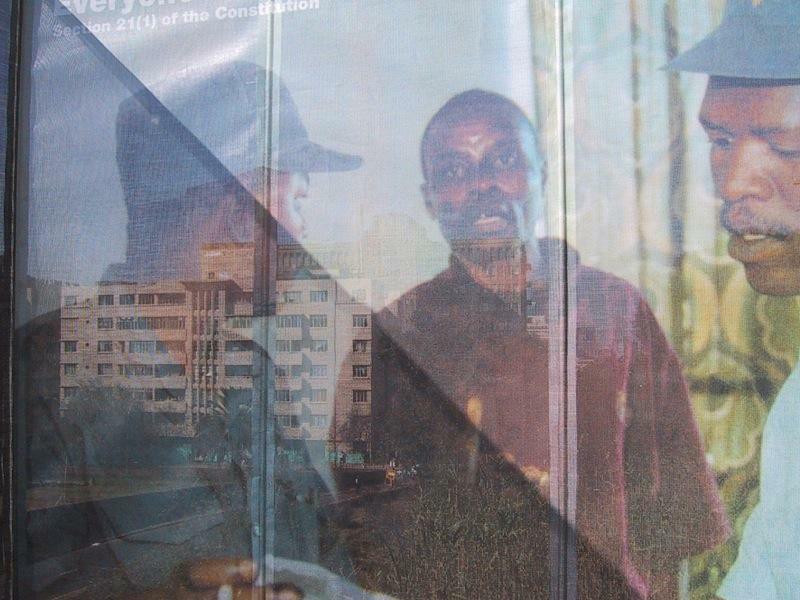 The Constitution was at the centre of South Africa’s transition to democracy and its guardian is still, the Constitutional Court. 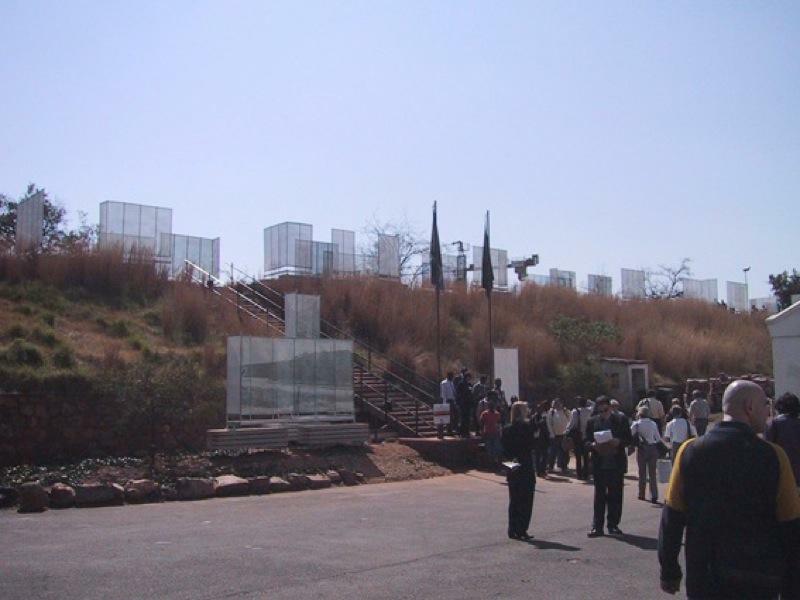 In 2002, a permanent building for the Court was in the middle of the process of being built on the same site as The Fort, the city’s notorious complex of prisons, which had closed its doors in 1983 and been derelict ever since. 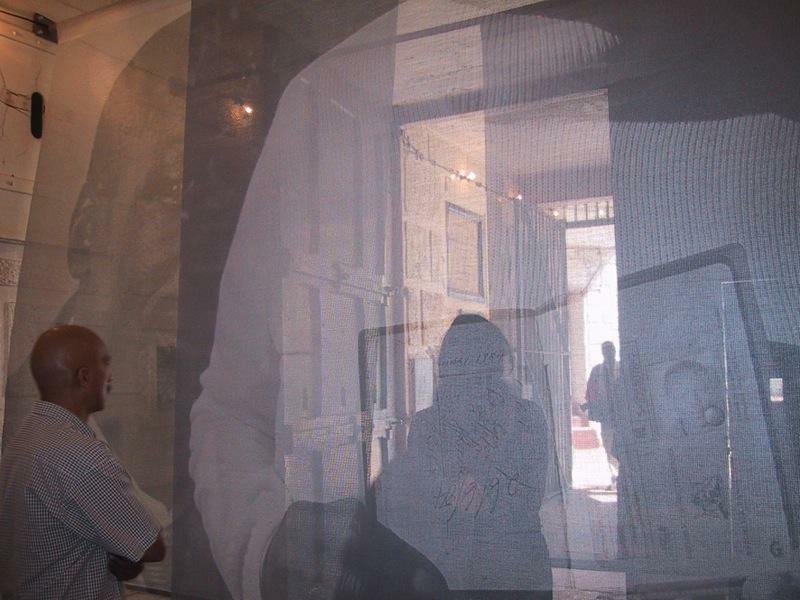 It had confined, within its walls, Mahatma Gandhi and Nelson Mandela, two major icons of liberation of the 20th century. 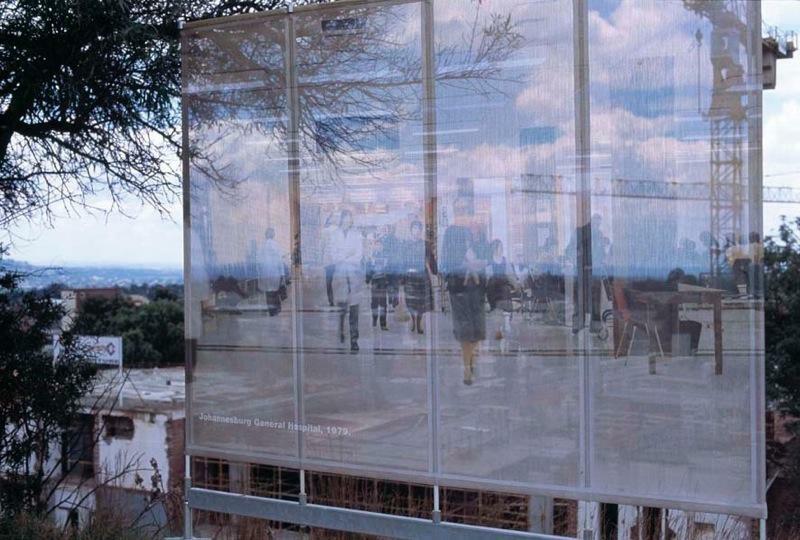 At that time, The Johannesburg Development Agency wanted to develop this precinct into Constitution Hill, a program-driven museum, cultural and educational institution. I was part of a multi-disciplinary team drawn together to produce a series of temporary outdoor and indoor installations on the site as part of an initial research process. My recent “Lost and Found” installation inspired our conceptual approach. 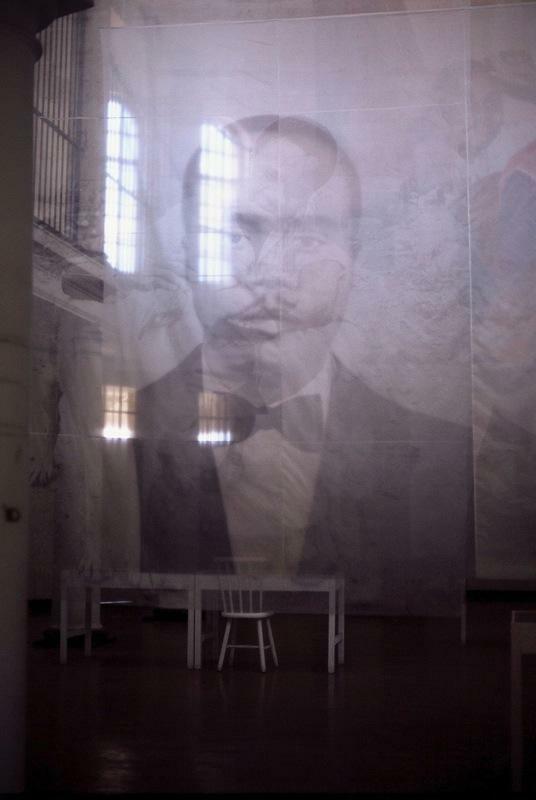 And, working with the notion of the palimpsest, we designed 3 major installations for 3 distinct locations across the prison precinct. 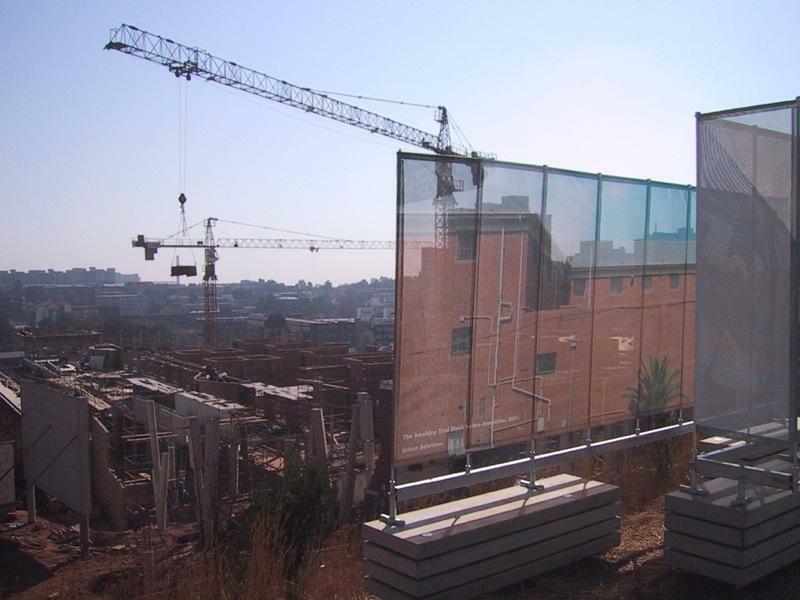 Everything we placed onto the site was printed onto a transparent medium (either PVC or silk) so that the image itself was visible, but so too were the site, and at times, the city beyond it. 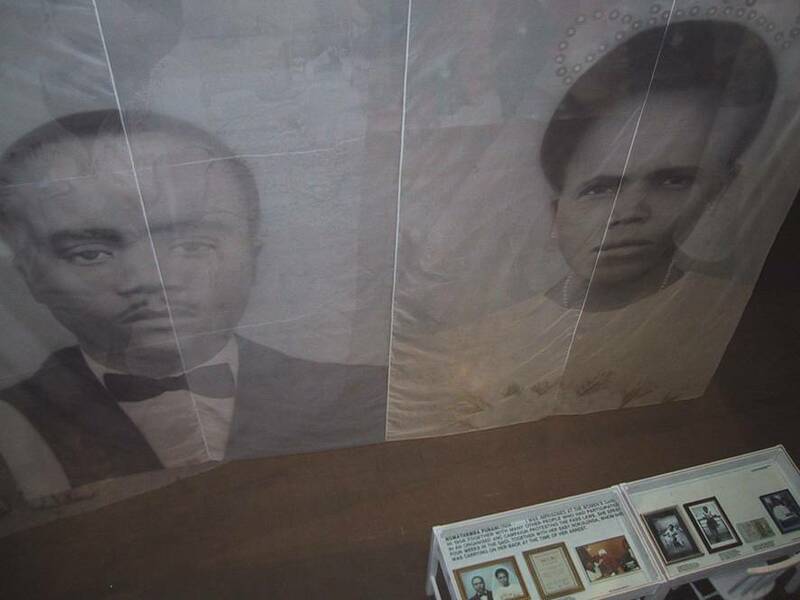 We were making connections between the past, the present, and the future; both in terms of the physical space and in terms of the new Constitution and Bill of Rights which we used as the template off of which to develop our content. 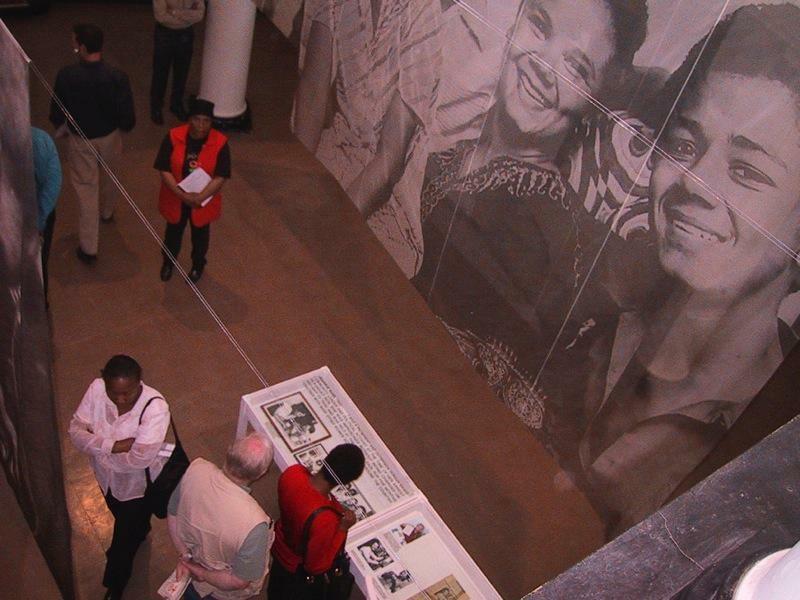 The first images here represent what we called The Rampart Walk, and are followed by Three Women, an installation that was designed for the former women’s prison, and finally there are several images representing our approach to the entrance of the The Fort, interrogating the notion, “Who is a Criminal” in the context of the former apartheid political system. 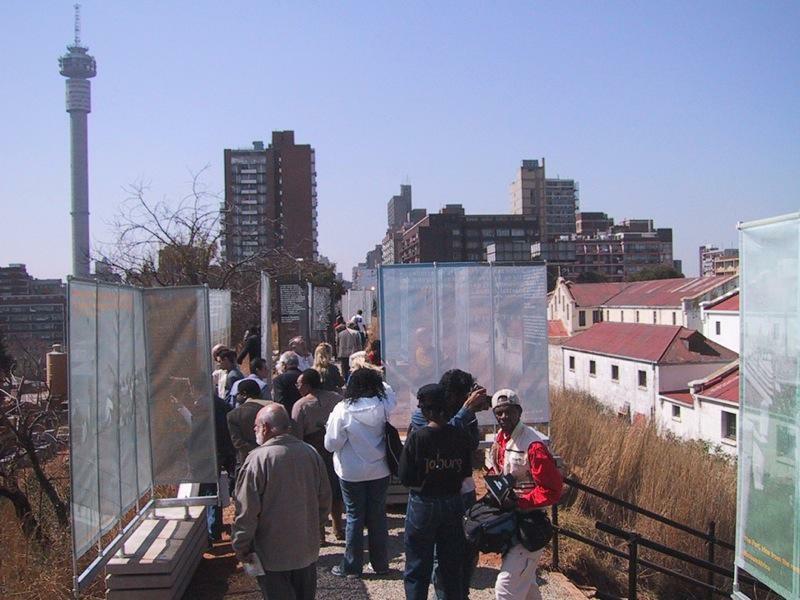 The Rampart Walk: The Fort ramparts provide a unique vantage point over the site of Constitution Hill, Hillbrow, and the City of Johannesburg. 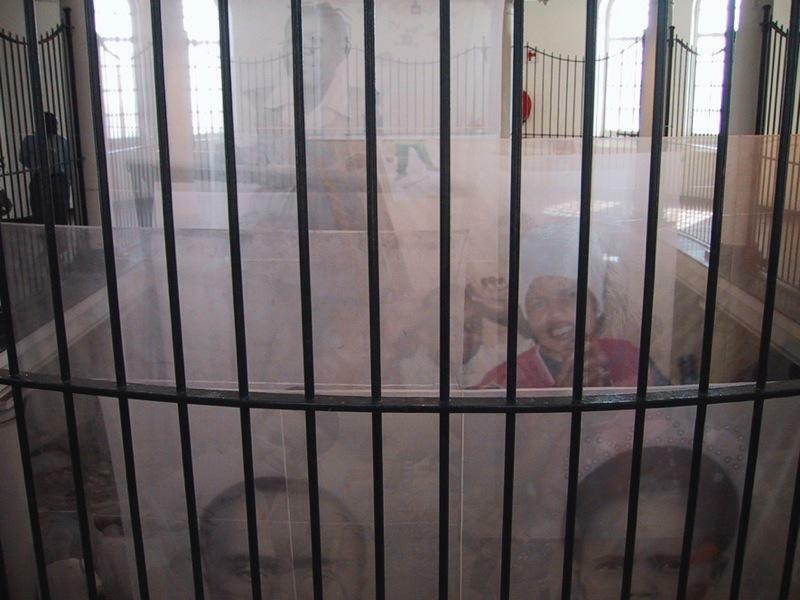 The ramparts are a bridge between the past –- as represented by the old prison buildings – and the future – as represented by the Constitutional Court. 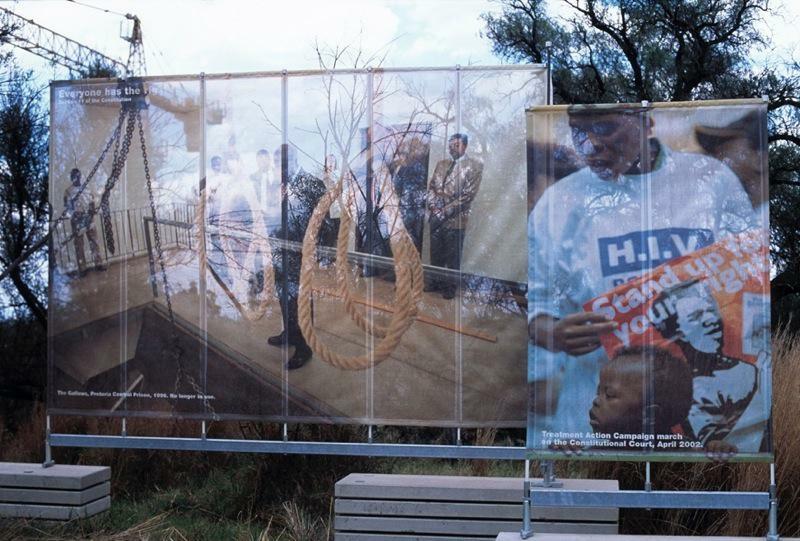 Using South Africa’s Constitution and Bill of Rights as a template, this installation of 60 transparent panels mapped the relationship between the site, it’s past and present context – and looked at where we were in 2003, (at a much more optimistic contemporary moment- it then seemed!) 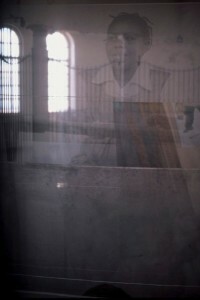 on the ramparts of a society in transition. 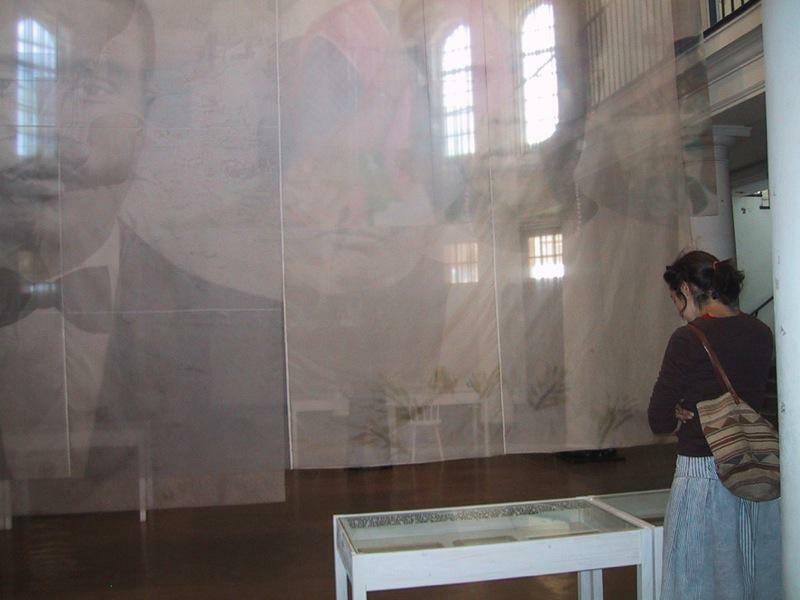 Three Women: This installation represented the lives of 3 women prisoners. 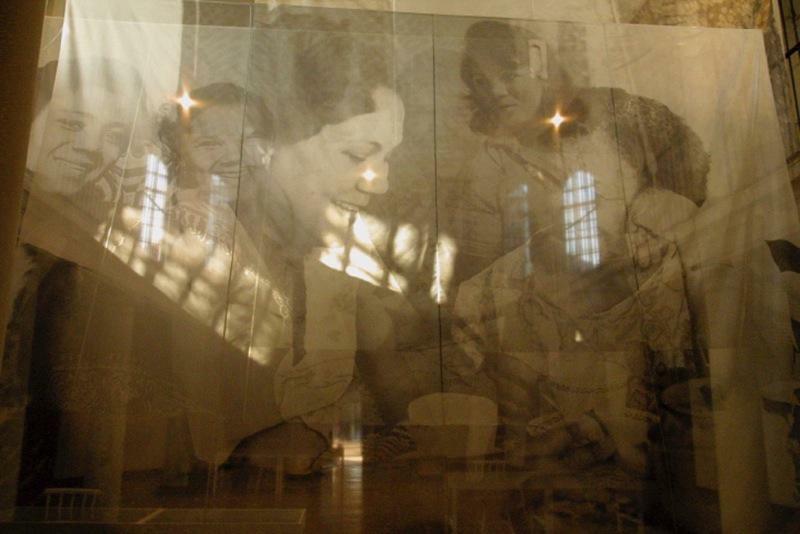 Daisy de Melker, Nomathemba Funani, and Jeannie Noel. A murderer (1930s), an ordinary woman spurred to become a pass resister (1950s), and a political activist from Durban(1970s). 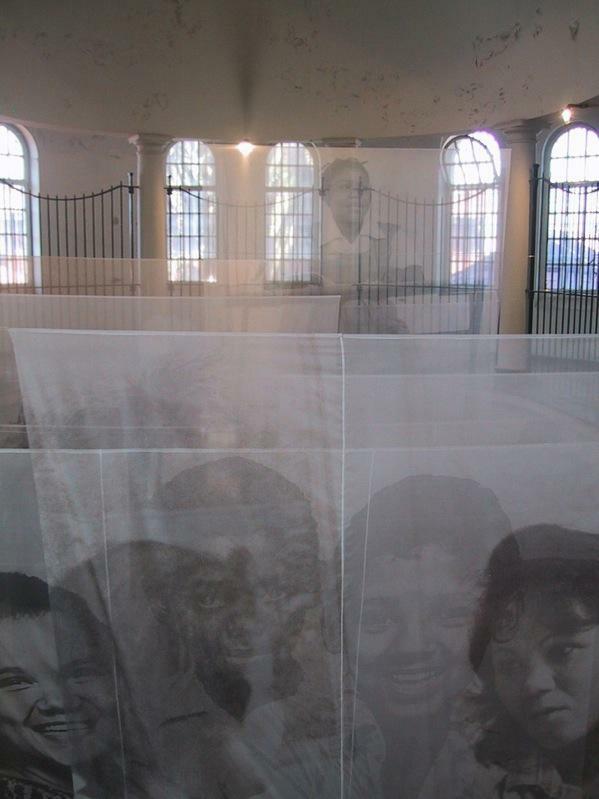 This was an installation in silk, sound, photographs and objects that interpreted the stories of three very different women who spent time at the Women’s Gaol, in 1932, 1956, and 1976. 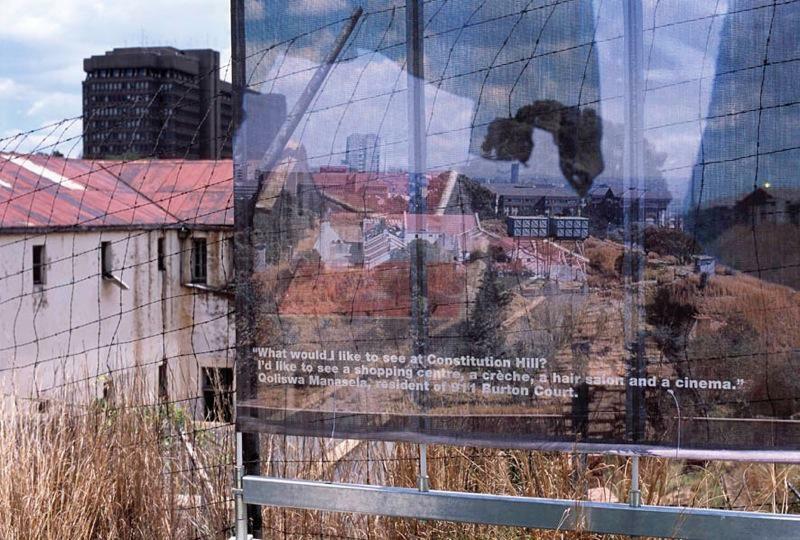 The Brief: To design and produce a series of temporary exhibitions introducing the Constitution Hill precinct to the public imagination; making connections between the past and present context of the site and the city around it. 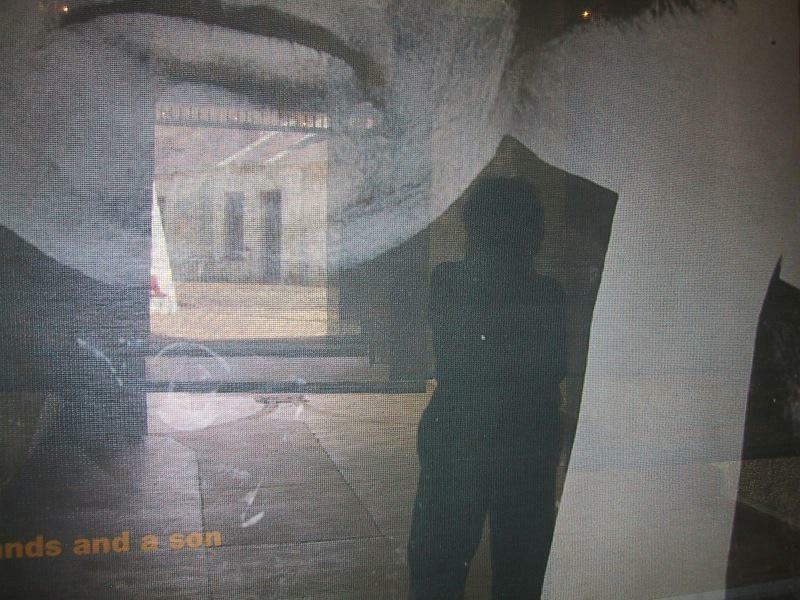 Media: Text, Photography, Signage, PVC Mesh, Silk Organza, Objects, Tables, Chairs, Concrete, Aluminum, Steel, Sound, Lighting, Video, Interactive Software.